This is a test of 360 photo sphere photos taken with the theta camera. 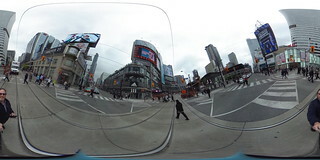 Here I am in the scramble intersection at Yonge and Dundas Streets in Toronto. If you give it some time, you can go in each picture and scroll around in all directions.